Since the world went crazy for sulphate free shampoo I definitely jumped on that bandwagon and notice a huge difference in my hair. I don't know to much about the science of sulphates but it can be quite stripping on the hair, leaving it dryer and more frizzy. I also never really see the point in spending a lot of money on shampoo. But this has really revolutionised my hair washing experience! It's so thick, I actually had to check it wasn't conditioner. It also lathered really well, considering its sulphate free. And left my hair feeling clean but without stripping. Having thick dry hair a good conditioner is essential. And this really hydrates and smooths my hair without weighing it down. I like to apply this, wait 2-3 minutes and rinse it off. Straight after rinsing I feel the difference in my hair. This is also silicone free. Every time I wash my hair I use an intense mask. I found this makes such a huge difference. This Lee Stafford one is the best I've tried! It's designed for hair that doesn't really grow. I'm not sure it actually makes hair grow quicker, but it is an amazing hair mask! It leaves my hair soft, shiny, more manageable and feeling nourished. I can't recommend this mask enough! I've been using this for years and I swear by it! When I don't use it really notice the difference. It's a leave in conditioner that's a multi tasking gem: It speeds blow drying, leaves hair softer and promotes shine. And what's better is it's so affordable! I have a blond ombre which means bleaching, after my 3rd bleaching session my hair has started breaking. It's a good job it's so thick! But to prevent the breakage I've been using this. And I really think its helping. It's a leave in cream, that nourishes the hair without weighing it down. Thank goodness for oils! Oils work wonders on my hair. This offering from Garnier is incredible for smoothing the hair and adding shine. My hair is really difficult to brush, it gets so knotty and this really helps smooth it so its easier to brush. Another winning product. This is great on wet hair to add shine, leaving it nourished and noticeably smoother. It doesn't weigh my hair down either. It contains Argan oil, Jojoba oil and Avocado oil, which really nourish the hair for a silky smooth, velvet effect! I actually prefer this over the famous Moroccan Oil. 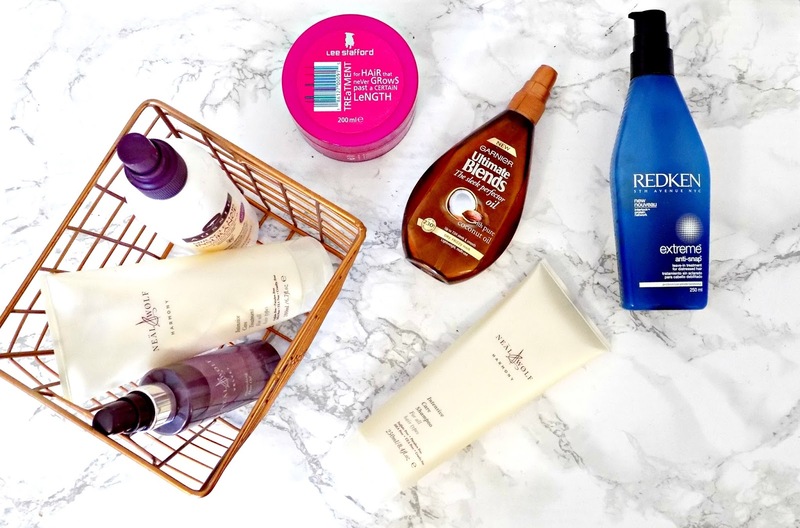 So there my top products for dry hair! What are yours?